He was born in Eastman, Georgia on September 27, 1926 to the late Bessie Brown Haley and Charles Roy Haley, Sr. but grew up in Morgan County. Charlie was a former member of the First Baptist Church of Eatonton, but later moved his membership to the First United Methodist Church of Eatonton. Following High School, Charlie enlisted in the Army serving in World War II in the Combat Engineers from September 1944 until 1946. He served first in the Philippines and then In Korea. He was often one of the men chosen as a scout to go ahead of the company to determine a safe path for them and to find the best place to ford a river etc. After a period of lengthy combat, his company was able to choose only one soldier for R&R and they chose Charlie. He left the military as a Sergeant. Following military service, he worked for Atlanta Gas Light for several years and attended the University of Georgia (now Georgia State) in Atlanta. He worked in sales for several companies and became the National Sales manager for a division of Sterling Pharmaceutical for 19 years prior to retirement in 1991. He and his first wife, Hazel Hunt Haley, married in 1949 and resided in Atlanta until 1984 when they moved to Reynolds Plantation. They were married for 62 years until her death in 2011. They were the first residents of Reynolds Plantation who were not Reynolds family members. In September 2012 he married Carol Mahany Williams, widow of Zeke Dunn Williams. Carol and Charlie were very happily married for approximately six and a half years until his death. Charlie is survived by his wife Carol, stepson Duncan Williams (Jenna) and step-grandchildren Daniel and Hanna. He is also survived by his nephews Bill Haley, Jr. (Libby), Russell Haley (Donna), Charles Haley (Ame), David Hallman (Linda), and nieces Joy Hallman Jordan (Bobby, deceased) and Ruth Hallman. He has multiple great nephews, great nieces, great-great nephews and great-great nieces. He was preceded in death by his parents, brother Bill Haley, Sr. (Faye) and sister Corrine Haley Hallman (J. D. deceased). 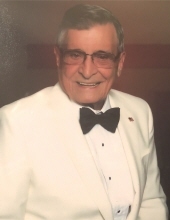 A visitation will be held on Friday, February 1, 2019 at First United Methodist Church in the Great Hall at 1 PM followed by a memorial service at 2 PM in the old sanctuary. In Lieu of flowers memorial gifts may be made to the First United Methodist Church of Eatonton. The family wishes to thank the staff of Compassionate Care Hospice, Athens, GA and Mary Clark, Certified Nurse’s Assistant for their wonderful care during the last few months. To send flowers or a remembrance gift to the family of Charles Roy Haley JR, please visit our Tribute Store. "Email Address" would like to share the life celebration of Charles Roy Haley JR. Click on the "link" to go to share a favorite memory or leave a condolence message for the family.